First of all, thank you so much for all the donations! Finally, I was able to buy a new Sonos speaker to create a stereo pair. We had thousands of downloads in just 15 days. That’s amazing! I released my humble UPnP experiments to GitHub: simple-upnp-api It makes use of the sonos-java library and adds a working group model to it. 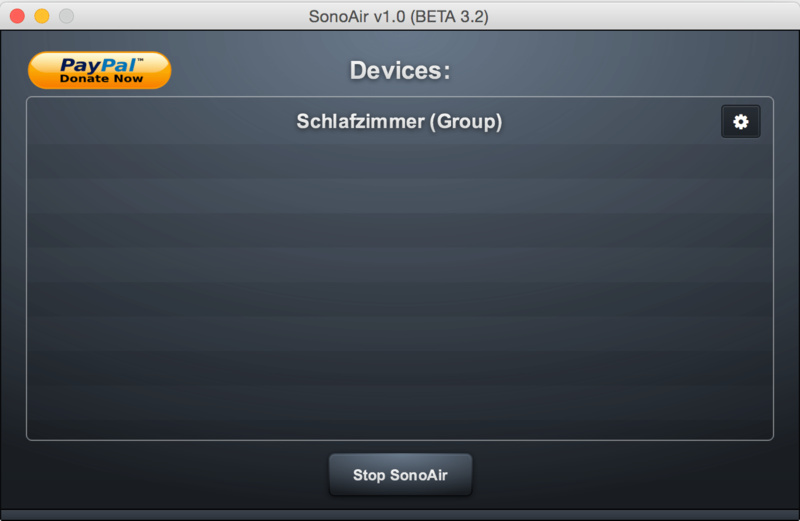 I hope that the new SonoAir beta will work for you as good as it works for me. Get it now! 40 Responses to "New SonoAir 1.0 (Beta 3.2) With Proper Group Detection"
Thanks for the new beta. I’ll try it tonight. I will try this when i get home. I’m trying out the new Beta from Apple, where SonoAir dosn’t show up. Do you see errors in the application log? Where can I find the app log? No Sonos devices with Version 3.2. So i returned to 3.1 wich works perfect. Can you check your firewall settings? Are incoming connections allowed for SonoAir? it gets stuck at ” Searching for Sonos devices on network…” . tried it manual with airsonos aswell -> same. You can enable “incoming connections” for SonoAir in the firewall settings. Same here. No sonos players found. Maybe it has to do with the new sonos software 5.4 I installed previsously. Sorry – same withe Sonos 5.3 and Sonos 5.4 – there is a bug in Sonoair 3.2. You’re right. Rolling back to Sonoair 3.1 solves the issue – with Sonos 5.4 as well. I’m already working on the next version where you will have more control like choosing between the old discovery mode and the new one. In the meantime use 1.0-beta 3.1 if that works for you. I think it doesn’t work on El Capitan or has somebody get it working? Yeah, saw similar comment on the Airsonos page. Once I switched to El Cap, the devices don’t show up in airplay even though Sonoair appears to be working fine. Sonoair has ‘allow incoming connections’ set. It will only work if the firewall is turned off when Sonoair is started. I’m running BETA 3.1. Tried downloading 3.2, it unzipped to Sonair 2, but still showed BETA 3.1 when run. However it now runs with my firewall enabled…. It plays to sonos groups, but these aren’t visible as such in SonoAir or the speaker control. Where can I find BETA 3.2 please? i would appreciate if this would work with itunes aswell because like this i have no use for it at all. i need to be able to play different to different speakers and not only one. and this is only possible with itunes. is this possible without the “alt left click on sound”- option? Does not find any sonos system. Version 3.1 also found my stereo pairs and showed them as one (=perfectly correct). Thanks for taking the time to work on this. I tried BETA 3.2 but my zones did not show up in the SonoAir app. Tried BETA 3.1 and it was much better. Though I noticed that 3 out of my 5 zones were duplicated. e.g. Living Room was listed twice. The three zones that are duplicated are Playbar/Sub combos. Today I will release a new version with improved discovery. You can also choose between different discovery methods. You can switch to Airsonos discovery mode and see if that works for you. If the problems still exist, turn on “debug mode” in the preferences and send me the output. Thanks for the output. The log actually indicates that your devices are discovered. Even if they don’t show up in the list they should be available as AirPlay device. The library that does/should do the group handling seems to have problems though. Can you try to connect via a different network device (if you use wireless right now, switch to ethernet for testing purposes)? What do you mean concretely ? The Sonos boxes are all logged by WLAN to the Bridge. I’ve mainly only “Play 1” without Lan connection. And the Paybar is too far away from a LAN port The Mac is logged to both the LAN cable and WLAN network. Was meinen Sie konkret ? Die Sonos Boxen sind alle per WLAN an die Bridge angemeldet. Ich habe hauptsächlich nur „Play1″ ohne Lan Anschluss. Und die Paybar ist zuweit weg von einem LAN Port Der Mac ist sowohl mit dem LAN Kabel als auch per WLAN im Netzwerk angemeldet. iTunes will not work in the near future. Only system sound is supported. Does the system sound work for you? Regarding the settings: can’t you open the settings or don’t they have an effect? Maybe they only work for one device of the group? Yes, system sound is working. And no, I can’t open any settings, neither of a group nor of a single speaker.